I have read this article about wildfire in Greece 3 days ago in SoL.haber Turkish web page. I had not find it in English at that day. But today I have seen it in English in SoL international. When seeing it in English due to I can share it in my blog I was excited; because this article by Aris Chatzistefanou was one of the good critizes that I have read in this year. In here you will read about how SYRIZA-ANEL coalition government encircled the public with capitalism and makes pressure on them. Aris Chatzistefanou, a Greek journalist and director, wrote an article against SYRIZA-ANEL coalition government, its supporters and bourgeois opposition movements that started a witch-hunt for citizens who demanded accountability for the recent wildfires that claimed the lives of 87 people in Athens, Greece. Wildfires ravaging through the seaside town of Rafina and the nearby villages of Mati and Nea Makri near the Greek capital torched homes, cars and forests, claiming the lives of at least 87 people while wounding hundreds on July 23, 2018. Yet, Kunalaki, of course, intentionally ignores the role of Greek capitalist class paving the way for opening forestlands to the settlements through various legal regulations for getting unearned income in collaboration with political powers in Greece for decades. Greek firefighters had explained in an event organized by the Communist Party of Greece (KKE) in May 2018 how the SYRIZA-ANEL government cut the Fire Brigade budget, saying that the Greek government had not provided for a single new equipment to the firefighters for the past seven years. The government and bourgeois opposition supporters have recently started a witch-hunt against those criticizing the current and previous governments about the tragedy caused by the wildfires in Attica. Whoever dares to speak the truth is treated as if they have barricaded the streets to prevent firefighters or to sabotage the fire-fighting aircraft. This is actually a routine practice implemented by every government in order to conceal their responsibility especially within the first 72 hours of such crises ─ as journalist Christos Avramidis reminded us. When an armed group terrorized civilians in an American school, you cannot question the right to acquire guns, the liquidation of health and wealth services (especially the ones related to mental health) or any other factors that could explain this issue and prevent the recurrence of such incidents. You can only pray for the victims. The dreadful difference we observed in the recent wildfires in Greece is that this practice is not only implemented by the government, but also by the main opposition party under the leadership of Kiriakos Michotakis [the leader of the right-wing New Democracy]. According to the leader of the New Democracy, now it is not the time to hold those responsible for this crime accountable; but it is the time for “unity and solidarity”. So, what is happening? Have the former rivalries among the political parties given way to a “political unity”? If so, why does the media such as the SKAI television supporting the New Democracy continue its atrocious (mostly unjust and vulgar) aggression against the government? There is a simple explanation of this “paradoxical” issue. This time, the criticism of the Greek citizens is not only about the inadequacy of the state mechanism (the response of every government is the same to this criticism: “We inherited a wreck”), but also about the political preferences of all governments in the years when it comes to the implementation of austerity measures. People lose their temper when they witness the crocodile tears of Jean-Claude Juncker [President of the European Commission, one of the symbols of austerity policies in Greece] or other European officials; because they are aware that these politicians and officials have imposed the austerity policies that entirely paralyzed the Greek state and cut the budget on fire safety. 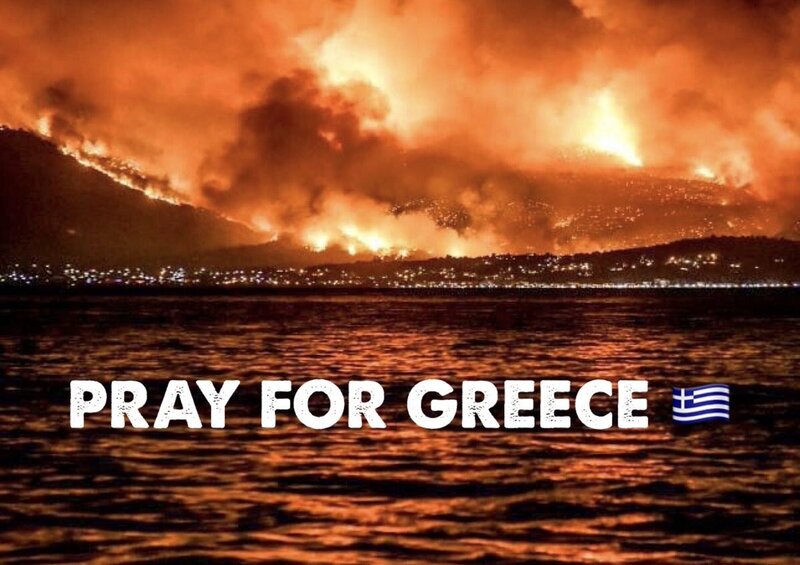 When listening to the speech of the Bishop Amvrosios of Kalavryta blaming atheism for the devastating wildfires, people burst with anger; because they remember that we bribe (literally) the bishops instead of allocating budget for doctors and firefighters. People are very well aware of how many firefighting aircraft the Greek government can afford to purchase if we were not the only country that allocates the highest military budget among NATO members after the United States, and the only country that increases its defense budget in the middle of an economic crisis, receiving loans from the U.S. Yet, the main opposition does not have even a word to utter despite the anger of the Greek people; because they also signed the same austerity agreements as the SYRIZA-ANEL coalition government have done; they transferred millions of money to the clerics and approved the same budget increases for war. That is why you cannot tell us when we can criticize you! We can donate blood for wounded people and carry out food aid, while we can also question your intentions. On the one hand, we can extol the heroic firefighters and volunteers with all our hearts, while on the other hand we can lay bare the terrible weakness of the state apparatus due to the austerity policies you agreed to implement. We can also list how many frigates the Greek creditors have forced you to purchase, and how many firefighting aircraft you have sacrificed to be able to get the F-35 war planes from the United States. NOTE: As we have said before, there is no such thing as ‘‘natural disaster’’. When a natural event occurs in a region where people live, it automatically becomes a political event and this event is responded to by political actions, not by wishes or prayers. SYRIZA was aware of this in the wildfires in 2007, but it seems that it has forgotten this fact in the fires in 2018. Aris Chatzistefanou is a Greek journalist and filmmaker. Born in Athens, Chatzistefanou started his career as a journalist in 1997 at Radio Skai 100.3, wherein 2005 he began his own show Infowar, a big success on Greek radio. In April 2011, he released Debtocracy, a documentary co-directed by Katerina Kitidi about the Greek debt crisis, which, despite garnering almost a million viewers on YouTube was not well received in the traditional media and caused the cancellation of Infowar and his dismissal. He has worked for the BBC World Service in London and Istanbul, and contributed short documentaries and articles to The Guardian and other international media outlets. In 2012, he co-directed with Katerina Kitidi, the documentary Catastroika that focuses on the effects of massive privatization in Greece and several other countries, the documentary features Naomi Klein and others. The film was released by the co-owned Infowar Productions. Aris Chatzistefanou co-founded the magazine Unfollow in January 2013; in 2014, he directed Fascism Inc., a documentary that shows how the economic elites supported fascism in the 1920s and 1930s, comparing it to the present situation. In 2016 he directed the documentary. This Is Not A Coup focusing on the effects of ECB and Eurozone policies in the European periphery. The SYRIZA-ANEL coalition government has unleashed an outrageous communicative campaign in order to throw the blame for the disaster somewhere else, except from itself. They blame the “weather”, the “climate change”, the supposedly “unprecedented weather conditions”, the “wind”, etc. In an interview to the BBC, Defense Minister Panos Kammenos had the audacity to blame the residents themselves because, as he said, they contributed to disaster by building illegal homes. In a shameless effort to justify the unjustifiable, Prime Minister Alexis Tsipras talked about an “asymmetrical phenomenon”. Behind such communicative tricks of mockery, which deceive and provoke the people, they are trying to hide the actual culprit of the tragedy: the barbaric capitalist system which generates the pursuit of profit. Profit-making is behind arson and land enroachment. A burnt forest consists a splendid opportunity for investment and profitability by capitalists and business groups. Capitalist development imposes- through one or another way- the concentration of land in fewer hands. In capitalist Greece, fire protection measures and forest fire-fighting infrastructure do not consist a priority. The policy that serves the capitalist profit do not regard fire protection as an important matter. The Greek governments pay up to 4.2 billion euros annually for military expendidures related to NATO, but when it comes to fire protection measures there is no money. You see, fire protection and fire-fighting infrastructure aren’t a profitable sector like the arms industry. Once again Mr. Tsipras is lying to the Greek people. The wildfires aren’t an “asymmetrical phenomenon”. What consists an asymmetrical phenomenon- which poses a continuous grave threat to the people- is capitalist system itself. This is the system that SYRIZA, New Democracy and the other bourgeois parties are serving. Enought with lies and hypocrisy! The unspeakable disaster of the last days in the suburbs of Athens is nothing but the mirror of capitalist barbarity. Besides immedietly after wildfires, Communist Party of Turkey made a statement and called solidarity with Greek people. In here you can read it too. Communist Party of Turkey: We call on all our friends and comrades to stand with the Greek people! According to the new laws in Denmark, in immigrant neighborhoods, which are defined as ‘ghetto’, some crimes will be double punished, and the children who are living in these low-income areas will be subjected to cultural assimilation under the name of ‘education of values’ by begining from one years old. While other Danish citizens are not obliged to take any preschool education until the age of 6, the trainings scheduled for at least 25 hours a week are compulsory for children of families living in ghetto from one years old. According to the law, which mainly involves the neighborhoods of Muslim families, the social security payments of families which do not send their children to the trainings of “values” such as Christmas, Easter and Danish are being cut off. Some proposals have been rejected as too radical, like one from the far-right Danish People’s Party that would confine “ghetto children” to their homes after 8 p.m. Challenged on how this would be enforced, Martin Henriksen, the chairman of Parliament’s integration committee, suggested in earnest that young people in these areas could be fitted with electronic ankle bracelets. The proportion of immigrants coming from Muslim countries such as Afghanistan, Iraq and Syria is 13 percent in Denmark, which has 5 million 700 thousand population. The unemployment rate in the places where Muslim immigrants are majority is estimated to be 40 percent, and it is estimated that more than half of the immigrant population has a very low income.